Did you see this in your Sunday paper? 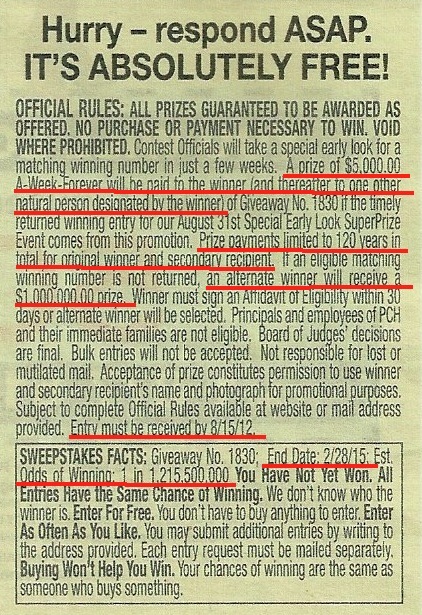 On the surface of it, it seems pretty honest and straightforward…not rigged or gimmicked as far as I can see…just a promotional sweepstakes (but see item (7) below.) 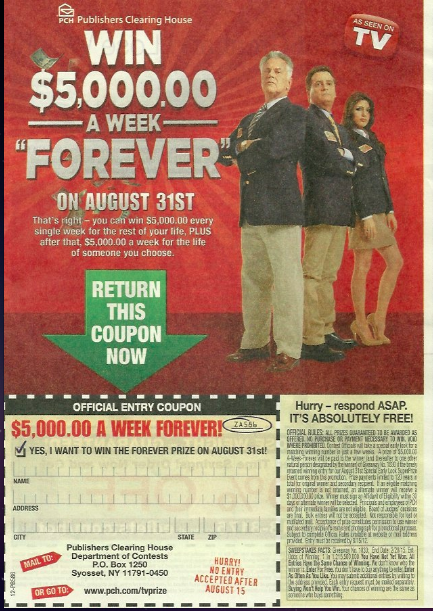 Altho it turns out 120 years constitutes “forever”…OK, so the Mayans were off a little. Of course with my luck, even if I did win, the Prize Patrol that showed up at my house wouldn’t include that lady on the right…instead, her dumpy, gray-haired maiden aunt. Still, for the fun of it, let’s do the math. Now it’s interesting that in these days where everything is nontransferable, in this case you can “pass it on” to someone else…what they mysteriously call one other natural person. Perhaps this means to exclude a corporation or other non-individual entity. And they limit it to 120 years…yes, years! Still, you wonder how much 5 Grand will be worth in 2132 AD…and will Publishers Clearing House, or even its successor, still exist…heck, will publishing still exist…or even money for that matter? But they do seem to acknowledge the inevitable rate of inflation…the alternate “lump sum” prize is One Million Dollars…whereas the payout for 120 years times 52 weeks at $5000 per week would be over 31 Million. Could it last that long? The Complete Official Rules online don’t say how old the initial winner has to be…let’s say 18. They must designate a secondary winner within 30 days and cannot change it thereafter…altho it can be a minor. Now you could do a lot of fancy calculating, but look at it this way: the payouts end when the secondary winner dies. 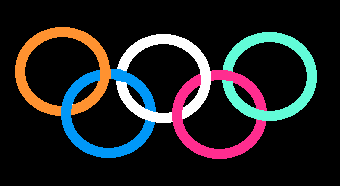 And if on August 31, 2012 that secondary winner is a newborn, it could conceivably live 120 years, especially since there could be any number of life-prolonging discoveries coming down the pike. Still, there are 2 things down at the bottom of this ad that concern me. The first is that while entries must be received by August 15, 2012…the “end date” for this giveaway is February 29, 2015. Geez, the judges must really check those entries, boy, if it takes that long! I tried reading the Complete Official Rules online, but could find no explanation. Feel free to try yourself. Kennedy cannot safely be assumed, all of them, to be moral cretins. (11) Great name for an old-time cowboy hero sidekick: Replaceable Jones. 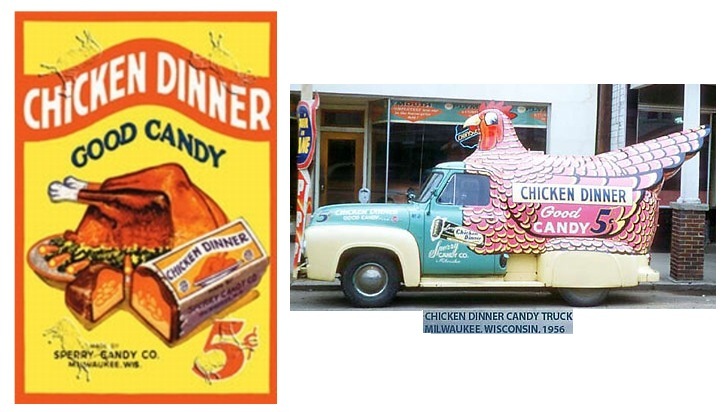 Available from the 1920s thru the 1960s, it had nothing to do with chicken, being a chocolate-covered nut-roll…the name came from “a chicken in every pot.” But then “Corn King” bacon and ham used to confuse me too…corn-fed hogs, I reckon? 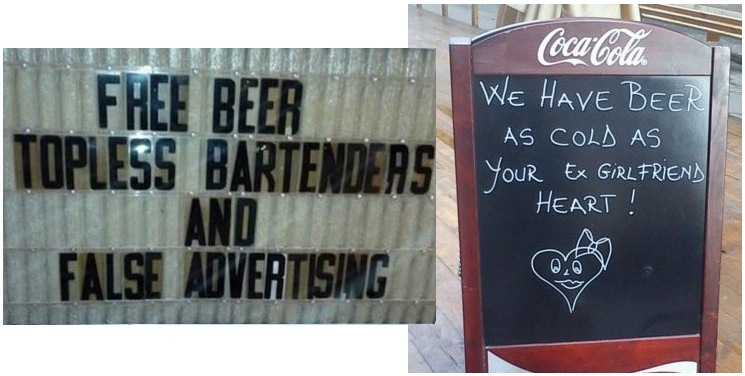 I never go to bars…tho they do sound like fun places…NORM!! !